Being diabetic means that you have to be very careful about the foods and snacks you eat. After all, to keep your blood sugar levels under control you can’t eat just anything. You have to carefully count your carbohydrates (carbs) to prevent your glucose levels from spiking or dipping too low. Many people can successfully manage their condition with the combination of a healthy diet, snacking habits, exercise regimen, and medication. Whether you are maintaining a strict diabetic diet or not, here are some healthy snack alternatives that every diabetic person can enjoy. There’s nothing wrong with snacking on whole wheat crackers, breads, and grains when you are feeling hungry. Whole grain foods help to lower blood sugar. Add some peanut butter, cottage cheese, or hummus to your crackers or toast to add some flavor and protein to give you a much-needed boost of energy. When shopping for whole grains, double check the contents to ensure that whole wheat, rye or some other type of whole grain is the first item on the ingredient list. You don’t necessarily have to give up some of your favorite snacks once you are diagnosed with diabetes. You just have to indulge in healthier versions of them. Homemade popcorn is high in fiber and much healthier than store bought microwave popcorn. Be sure to use canola oil when making your popcorn to keep its carbohydrate content down. Not all fruits will send your blood sugar on a ride as long as you add some protein to help counteract the effects of their glycemic index. Healthy ways to enjoy your fruit include snacking on bananas with peanut butter, eating a small cup of yogurt with a handful of berries, or eating a small apple, orange, or some dried fruit. Be sure to use a measuring cup when adding berries to ensure that you are not going over your carbohydrate limit if you are using the carb counting method for your diabetic diet. Cheese and milk are both good sources of protein and make for very tasty snacks. Add some variety to these foods by enjoying them with a small cup of whole grain cereal, crackers, or some vegetables such as carrots, baby tomatoes, and celery sticks with raisins. Start eating nuts during snack time. Nuts like almonds, walnuts, peanuts, cashews, pecans, and sunflower seeds are full of protein and won’t raise your blood glucose levels very much. Since they are high in calories, you need to be careful of how many you eat. Nuts are more of a diabetic friendly food than many kinds of crackers and breads. Since they are high in protein, you won’t need to eat as many to feel full. The key to regulating your glucose levels is to watch your portion sizes and to eat smaller meals throughout the day. This will also help to keep your weight down. If you aren’t familiar with portion sizes, don’t hesitate to use food scales, measuring cups, and spoons. Do not indulge in snacks when you aren’t really hungry. On the same hand, don’t confuse your body’s hunger signs either. Sometimes the brain sends out hunger signals when you are actually thirsty. Increase your water intake to prevent excessive hunger and blood sugar spikes. 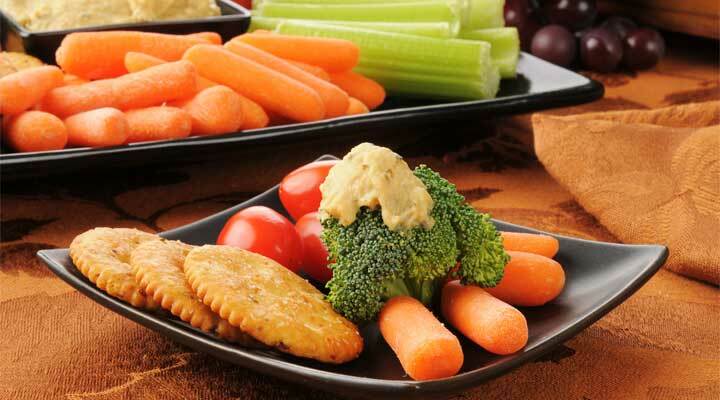 Plan out your snacks on a daily or weekly basis to keep yourself from snacking unnecessarily. Planning allows you to stock up on what you need beforehand so that you aren’t tempted to purchase foods that you don’t really want or need. Planning your snack menu also enables you to keep more money in your wallet. Snacking is an excellent way to stave off hunger, regulate glucose levels and gain energy. With the right snacking habits and diabetic diet, you can improve your condition and outlook on life.